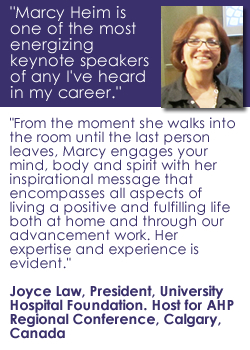 On a limited basis, Marcy works with individual clients. Her services include feasibility studies, development audits, strategic planning, and major gift development and management. Generally the first step is to book an “Artful Action Assessment.” This in a personal meeting with staff and key leadership to have an overview conversation. 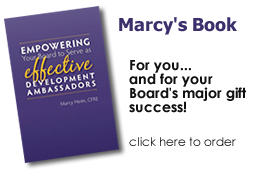 During this meeting, generally about 2 hours, we focus in on your key concerns and Marcy will assess your current situation, provide immediate coaching, and identify which, if any, service packages are the best fit moving forward. This meeting allows us both to determine if working together is a fit for only small investment of time and dollars. 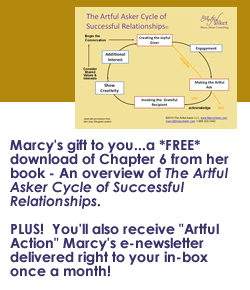 Contact Marcy today by email or call 1-888-324-0442 to get started.